The Case-Book of Sherlock Holmes (1991–1993) known as Sherlock Holmes, are a series of adaptations of Arthur Conan Doyle's Sherlock Holmes stories which were produced by Granada Television and originally broadcast by ITV in the United Kingdom. The series starred Jeremy Brett as Holmes and David Burke (in the Adventures series) and Edward Hardwicke (Return, Case-Book, Memoirs) as Dr. Watson. The programme adapted 42 of the original stories in 41 episodes, with 36 running for 50 minutes (in a one-hour timeslot), and five being feature-length specials. Adventures ran for two series totalling 13 episodes, from April to June 1984 and August to September 1985. Return ran for two series from July to August 1986 and April to August 1988, as well as the specials "The Sign of Four" and "The Hound of the Baskervilles", which aired on 29 December 1987 and 31 August 1988 respectively. Case-Book ran for one series from February to March 1991 and three specials which aired on 2 January 1992 and 27 January and 3 February 1993. Memoirs ran for one series from March to April 1994. A short episode was also produced as part of "The Four Oaks Mystery" which aired during the ITV Telethon in 1992. Sherlock Holmes appeared in the first part, with the casts of Van der Valk, Taggart and Inspector Wexford appearing in the second, third and fourth parts respectively. 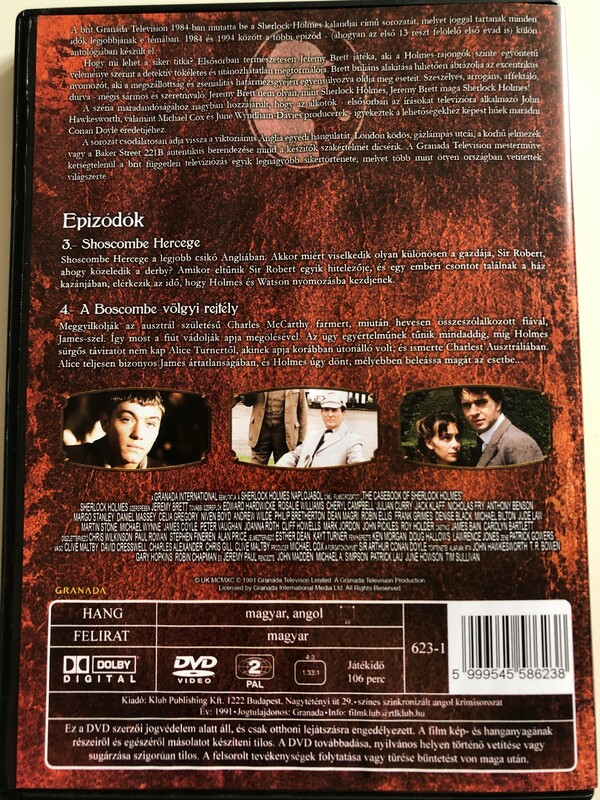 A Sherlock Holmes kalandjai egy brit krimisorozat, ami Sir Arthur Conan Doyle novelláinak feldolgozása. A főszerepet Jeremy Brett alakította, míg dr. Watson szerepét két évadon át David Burke, később a sorozat végéig Edward Hardwicke játszotta. Shoscombe Hercege a legjobb csikó Angliában. Akkor miért viselkedik olyan különösen a gazdája, Sir Robert, ahogy közeledik a derby? Amikor eltűnik Sir Robert egyik hitelezője, és egy emberi csontot találnak a ház kazánjában, elérkezik az idő, hogy Holmes és Watson nyomozásba kezdjenek. 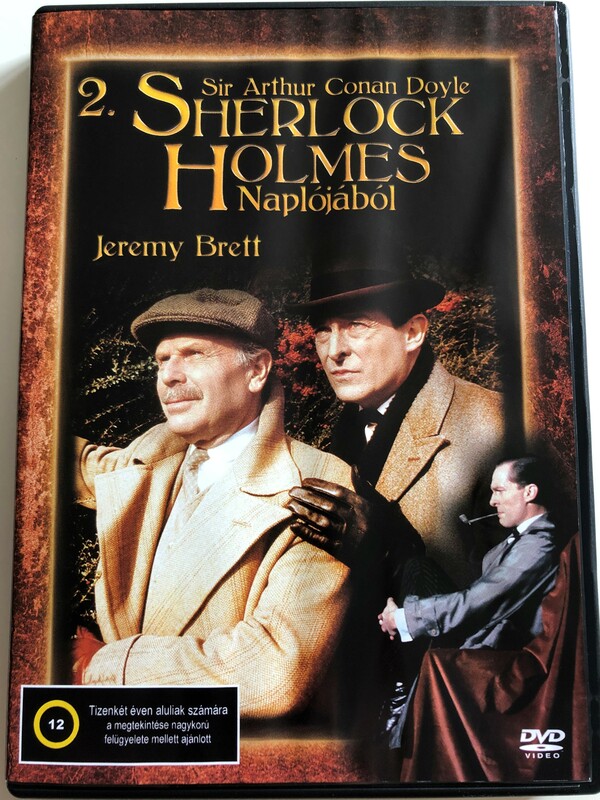 Click the button below to add the The Casebook of Sherlock Holmes DVD 1991 Sherlock Holmes Naplójából / Directed by John Madden, Michael A. Simpson / Starring: Jeremy Brett, Edward Hardwicke, Rosalie Williams / Disc 2. - Episodes 3-4 / Sir A. Conan Doyle to your wish list.